Smiles is an addictive match-3 style arcade game for the iPhone & iPod touch developed by Sykhronics. If you enjoy match 3 style games, you can skip the rest of this review and just buy this game. Trust me, this is a rare gem, you will not be disappointed. As with any other hit game, Smiles’s success has to do with being fun and simple to play, endowed with a host of rewarding and tactical features. The game flows at a natural pace, but doesn’t slow you down. You can play as fast or as casual as you like. The game board graciously rotates so you can play in landscape mode as well. Smiles is actually 2 games in one. Zen will test your logic, strategy and patience skills. A little like the opposite of the Lights Out game mixed with match-3 gameplay, Zen integrates gameplay from Sudoku, Mahjong and Solitaire. In Zen mode you have to make the entire board light up by making matches of 3 or more. You see a large tile on the bottom right of the screen, which is called the “current tile”. 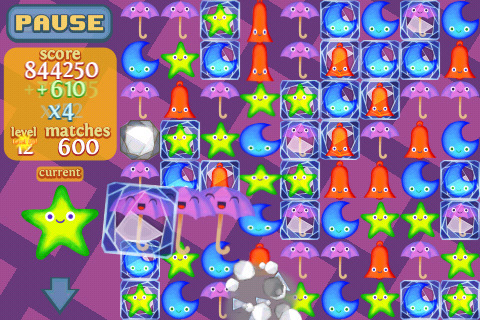 You can swap this tile with any other tile on the board to make a line of 3 or more matches that light up. You keep swapping out this tile until all the tiles are lit up. As you play you might have to break up existing matches and make new ones. You can match lines going both vertically and horizontally, which sometimes overlap. The game counts the number of moves and shows you the percentage completed as you play. You are timed as well and all these stats combined make up your overall standing in the Zen scores section. As the name implies, in this mode you make matching tiles drop down. The game starts out with regular tiles and they begin either freezing into ice blocks or rock blocks. Ice tiles break with 3 matches and rock tiles with matches of 4 or more. You can rotate the iPhone around to change the dynamics of the board via gravity. As the tiles drop you will get combos when additional matches break and drop. You keep playing and level up until there are no moves left. Scoring is composed of your time lasted, matches found, multipliers earned, and ice/rocks broken. Drop can also be played in Drop+ and Avalanche modes. Hit the Pause button, and you’ll find the Theme menu, where you can toggle through 3 colorful board tile styles. The 3 Themes are Weather, Vegetables, and Blocks. There are 4 Difficulty levels: Easy, Medium, Hard, and Master. Earn up to 140 achievements as you play. The sound effects and music in the game are bright and entertaining. 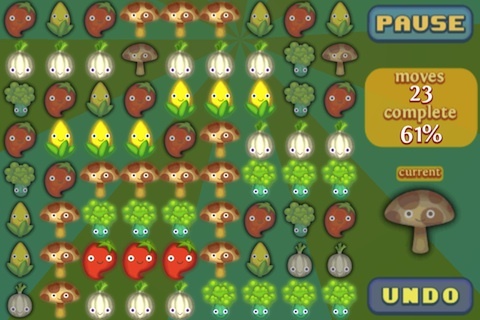 Graphics are sleek and the jiggling, winking, smiley characters add their own personality to the game. The price of the game is a bit high but you do get a very high quality game. Sykhronics is not a big time studio but the developer Michael Kasprzak has been in the industry for a long time and has worked on major projects with Mattel, Disney, and Milton Bradley. A separately sold iPad version (Smiles HD $5.99) is also available in the App Store. The iPad version of Smiles is pretty much identical to the iPhone version of the game with HD graphics. AppSafari review of Smiles was written by Joe Seifi on April 3rd, 2011 and categorized under App Store, Arcade, Board, Featured, Fun, Games, Puzzler. Page viewed 4491 times, 1 so far today. Need help on using these apps? Please read the Help Page.